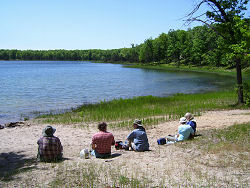 This is a small, 339-acre, lake with mostly private shoreline, but the northern edge is owned by the Manistee National Forest. Access- sand Forest Road 5540 off paved Hoague Road at corner with Rybicki Road. From US 31, turn east on Hoague Road (13.5 miles north of Scottville, or about 6 miles south of Manistee). Go 4 miles, and turn right (south) on a dirt Forest Road, clearly marked to Hoags Lake. The lake is reached in just 0.2 mile.